Bad weather seems to be following me around this season. 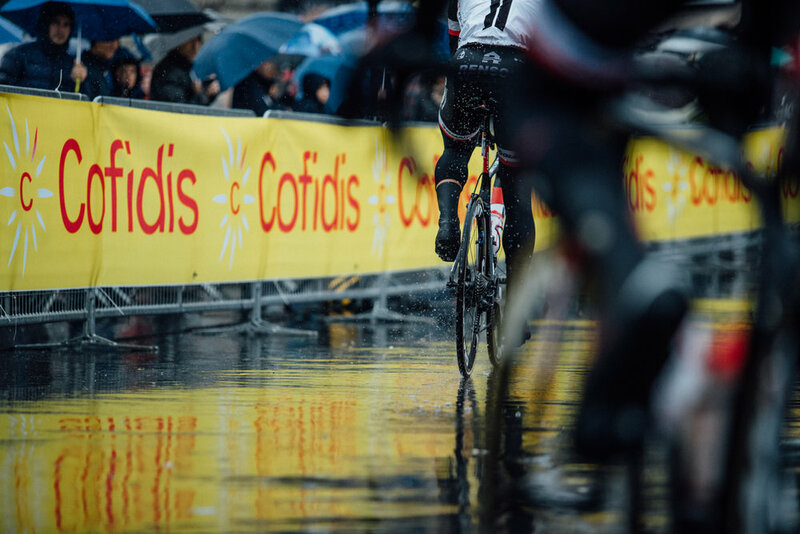 Not for the first time heavy rain has dampened proceedings, and La Classica, Milan San Remo was no exception. With riders reluctant to leave the warmth of the team bus, it was thin pickings for the photographers who braved the elements at sign on. Having to leave before the race start, so as not to get held up by Milan's horrendous traffic, meant missing out on most of the team presentations. Leaving it to the last possible minute we headed off, soaked through, into the gridlock of Milan. With motorcycle outriders desperately trying to clear traffic, we cut through the city with some rather questionable manoeuvres. Once free of the centre, we made our way to the first stop before hitting the auto strade. A couple more stops before we headed to the highest point of the race, which today was a dead loss. Shrouded in low cloud with almost no visibility, the panoramic vista that greets the riders on a clear day, was lost. Backtracking along the course we reconnected with the auto strade that parallels the race almost for its entire length. Full gas now all the way down to the coast to get ahead of the peloton. A couple of stops along the shore and it was onto the finish. Once in San Remo we headed to the finish line, with the 'very Italian' crowd glued to whatever screen they could find, keeping tabs on the progress of the race. A roar came from the crowd as NIbali made his audacious escape on the Poggio and as each kilometre ticked by the partisan crowd got more and more excited, crossing the line with arms held high and the peloton bearing down on him. The atmosphere was electric. The first Italian winner in eleven years and boy did we know it.